For the spiced oranges, segment oranges and set aside. Bring Prosecco to a boil, then add gelling sugar, lemon juice, spices, and honey and simmer over medium heat until it becomes a thick sauce, approx. 10 min. Allow to cool down, then add grenadine syrup and orange filets. Refrigerate until serving or, approx. 15 min. For the cinnamon cream, whisk sugar and egg yolks together in a small bowl until foamy and light. Fold in mascarpone, honey, vanilla seeds, and cinnamon. Refrigerate for approx. 15 – 20 min. In a dry frying pan, toast sliced almonds at medium-low heat for approx. 3 – 4 min. until golden brown; let cool completely. Tear gingerbread cookies into bite-sized pieces. Place gingerbread in serving glasses, and soak with Grand Marnier. Place spiced oranges and cinnamon cream on top. Continue to fill glasses with in this pattern of gingerbread, oranges, and cinnamon cream. 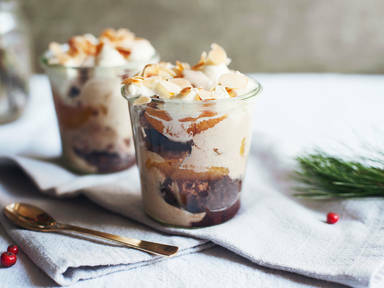 To serve, garnish with whipped cream and toasted nuts.